Dear Uncle Bill and others. At long last, out of the blue, I get news. Civilisation is once more within distance. Once again your concience [sic] has forced you to write to the man who is winning your blasted war for you. I hope your affairs have settled down and taken a more normal turn. There are one or two more things I hope about you but I don’t think the language would get by the censor. From what I hear things at P.R. are going O.K. Rusty is having a few [deleted] half [/deleted] half days. The obvious thing is to sling the perisher out and the job must go perfect. Common logic. Things – unfortunately for your wishes – are going fairly well here. I am still doing my double turn – two men’s work. Otherwise it is like a rest cure – there is nothing to do but sleep when we get to bed – when. We still manage to keep sane and sober – the latter a safety precaution against poisoning and the former is of course comparative. Now that Spring has come to Tiree we can see the island better. After one look I don’t care if winter comes back. Life still plugs on its weary [deleted] indecipherable word [/deleted] way and barring the date we get very little variety. Not that I expect to collect any sympathy from you people by a recital of my sufferings. About this time of the year an old friend of mine – Harry Straw – will be observed making paper bags. This is a part of the usual spring clean of the old oak chest. The notes are retied in bundles of fifty and put into nice clean bags. Let me know if he addresses a few to me and I’ll keep a look out for it. the new income tax came in. I suppose he is sorry he doesn’t drink and smoke – think of the money he could save giving them up. I am sorry to hear that Cherry is taking the rose-strewn path to ruin. Spending his holidays with Moloney will be his downfall. Moloney, in the words of one of my contemporaries, is so low, that it would take a special dispensation from heaven, to raise him to the level of utter degradation. he’ll have Waterlows working for him. There seems to be an undercurrent of jubilation in your letter, at my return to this sample of your “lovely spots this side of Scotland”. If I am correct in this, then you and I will do more than celebrate when I eventually shake the shackles. We have now got to the stage where we are expecting to be recalled any day. This in case you don’t know means precisely nothing. It is just a guarantee that when we eventually pass out from old age they will ship the bodies to the mainland. get the rest of the chapel out of their clubroom. Thank Eddie (ink room) for his wishes. Give my regards to the Guv‘nor. Harry Ashton can take them in with the tea – from poet to potman. Remember me to the engineers – OPA’s and others. Kiss Jack Denny – if he feels strong enough to stand it. P.P.S. Lets [sic] have a bit more bloody letter answering. 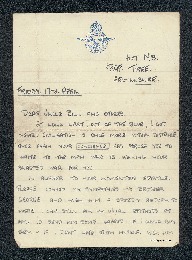 Peter Lamprey, “Letter from Peter Lamprey to W Gunton,” IBCC Digital Archive, accessed April 20, 2019, https://ibccdigitalarchive.lincoln.ac.uk/omeka/collections/document/6636.